Campsis radicans is an enthusiastic grower with a rambunctious root system. The Trumpet Creeper will readily start new plants from the roots, often reaching under sidewalks and starting anew on the other side. Campsis radicans also has viable seeds. While Campsis radicans likes water it hardly needs it and will grow just fine without much at all once established. The Trumpet Creeper can be planted in a shady garden, and can find its own sun as it can reach 30-40 feet. Planting with a root barrier in place is a good plan, so is providing ample support for a fast growing large vine. 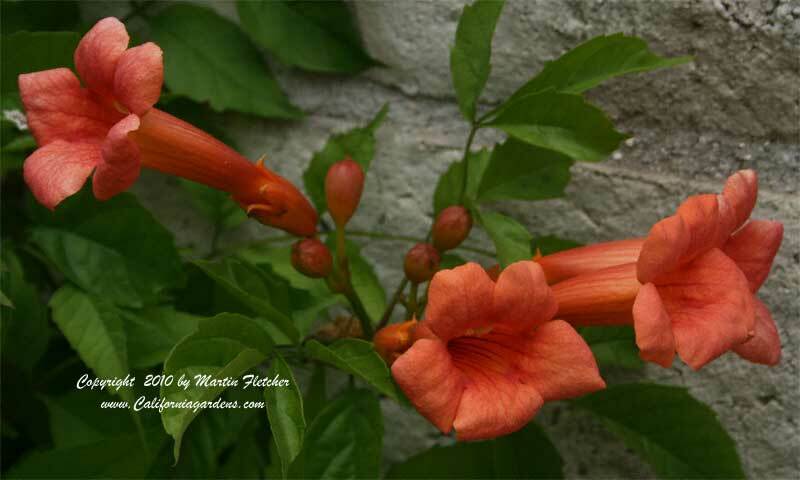 Campsis radicans has showy orange or red flowers that attract hummingbirds throughout the Summer blooming period. Campsis radicans is native to central and eastern United States. Plants are Winter hardy to zone 4 but will likely die back to the roots in colder climates. Flowers and foliage of Campsis radicans known as Trumpet Creeper. High resolution photos are part of our garden image collection.